Synopsis: In a year-long competition, school children from Yuba County, California compete to see who takes the most steps during after-school exercise time, as measured by a pedometer, in an imaginary race across the United States. The consistent walkers (or runners or climbers, or whatever each child chooses to do) get rewards during the contest. We monitor the children’s height and weight (BMI) and blood pressure during the contest, and we will perform a survey and follow-up measurements 4 months afterward. A parade is planned to celebrate the children’s effort with parents, doctors, community members, and newspaper coverage. The CDC states that 64% of adults are overweight or obese, and now 15% of children and adolescents are overweight, a rate that is growing and has doubled since the 1970’s. Although no study has been done on the rates of obesity in Yuba County or the West Linda community in particular, there is a high rate of poverty in this area, which has been associated with higher rates of obesity. There are 50-70 children attending the afterschool program at the Riverside Restoration House in West Linda, and so far 44 kids have been signed on to the project and have been making tracks in a flurry of activity. West Linda is a small community south of Yuba City in northern California. The group of children I am working with is from Cedar Lane elementary school, in an area with a large Hmong population, estimated at 15-20%, as well as Hispanic, white, and African American groups. 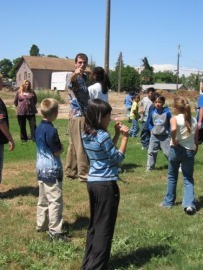 As of 2002, 25% of children in Yuba County lived in poverty, one of the highest rates in the state. It is a rural community surrounded by agricultural land, devoted largely to olive trees. The closest pediatrician’s office is in Yuba City, a 15 minute drive to the north, though there are county medical facilities located closer. Project partners included: Riverside Restoration Center, Sutter Pediatrics (Yuba County), Harmony Health Family Resource Center, Larry Geweke Ford and Wal-Mart.